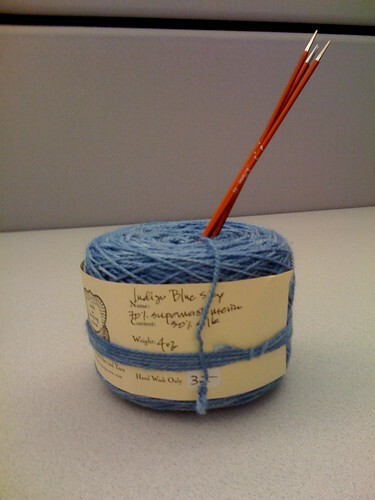 Better Than Yarn: Why yes, Virginia, there IS knitting! Ok, these are the humble beginnings, but I've made a few adjustments (shocking, I know), and I'm digging on all the twisted stitches and swirlyness of the pattern. Alas, four pattern repeats in, I found myself drawn back to my Tangled Yoke cardigan. 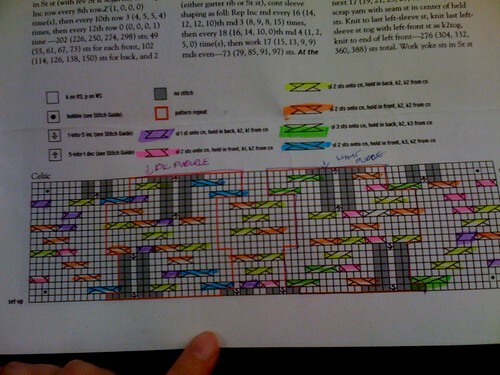 Part of it is the pattern itself; it's written clearly, and I especially appreciated the caveat about the cable chart- where Eunny assures the intrepid, suspicious, frequently-attacked by her knitting- knitter that, yes, the stitch count will change. Go with it. So, with Eunny's assurances, I leapt in with both feet. (Without a lifeline, which I realized may have been prudent AFTER I had done the set up row. Eunny, I'm depending on you. Don't let me down.) Row 1 worked out, after I kicked myself for omitting one knit stitch per repeat (my fault, not Eunny's), so I'm feeling optimistic about rows 3-18. I'm not often a monogamous knitter, but I'll say it again, not only am I enjoying knitting this, but I'm super-excited about wearing it. I have a set of glass buttons, whose vintage is purported to be the 1800's. (No pics of them now, but they are PERFECT.) Andrew has declared this to be my Rhinebeck sweater, but at the rate I'm going, I might have time to knit TWO. can't wait to see photo-documentation of your tallulah tangled yoke! i bet it is stunning. Gorgeous blue. Can't wait to see them! Wore your socks to my post-op appointment: I wanted that doctor good and impressed. Brilliant usage of highlighters! You missed a cable 12 rows up though, between an orange and a pink cable. It should be yellow. I love reading cable charts - but that doesn't mean my fingers and my brain always talk to each other when trying to follow one! Can't wait to see how yours is turning out. i loved making that sweater--but i seriously frakked up the cable once and it was torture undoing and redoing. clearly i should've tried color-coding. can't wait to see yours! That color coding is brilliant! Can't wait to see the sweater.